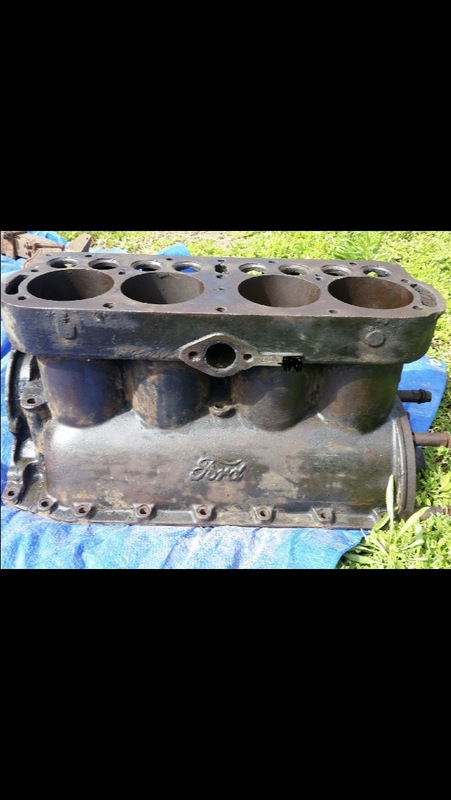 Hi, I have this 1912 engine block in Australia with an engine number between 111400 and 111500. The question I would like to ask is because this engine is in Australia could it be possible that it was delivered in a Canadian production vehicle to Australia. Were these engines sent to Canada for production. That location is not common, but I've seen it many times. B series were all in 1913 model year Ts. What I discovered recently with my '12 block is a failsafe way to determine an early block is to look inside at the back to find only one vertical gusset centered under the third main bearing. I don't know when they changed to two gussets but the '13 blocks I have checked did not have the single one. You are correct Darel, mine was made in late '12 but it is in a /13 car Sorry for the mistake. B3xx is here in Minnesota and it is a 1913 Model T Touring made in 1912, as many 1913s were. 4/16/12 was when the made in USA was added to the block and usually chiseled off for Canadian T's, not ground. I should have mentioned on why it looks funny,the numbers are on top of the water inlet, the block is upside down as the date was fitted upside down. 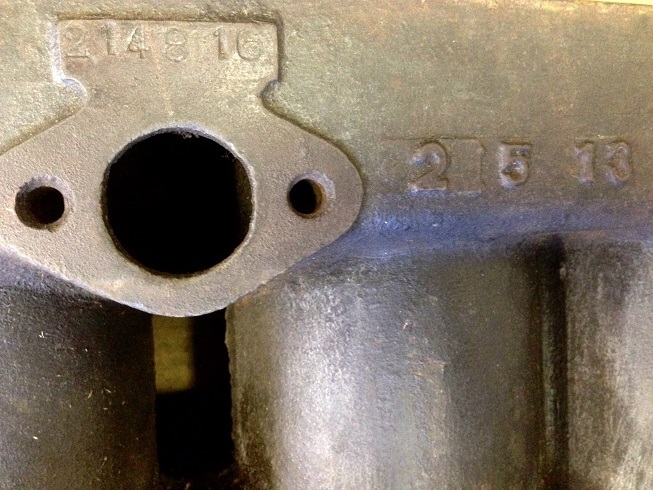 I realize I'm going a bit adrift here, however when Gene posted about using the single reinforcing gusset to identify a 1912 era block, I went out to my shop and looked at the underside of my 1913 block - serial No. 214,816, cast 2-5-13. It appears the casting mold for my block must have been a survivor in that there is but a single gusset. I learned something new today thanks to the forum. I thought that everything prior to 1913 that Ford of Canada had was made in the USA but starting in 1913 sometime they began to make their own things and that is when Made in Canada or Canadian marking in general began to appear and various features of the T didn't necessarily line up with what was going one on either side of the border after that. Steve Stapely is the guy that I always thought had the most correct info on these issues. Weren't there four different locations for the serial number in model year 1912? Earliest on the other side behind the cam gear (or did that end in 1911 model year?). Then it moved to above the water inlet, but on a crude spot at the top of the block (with the casting date below it on some as I recall). Then it was on an embossment behind the water inlet, as shown in the original post. About the middle of the model year, it finally ended up where it remained for the rest of model T production, above the water inlet on a nice embossment. Before my computer had a partial meltdown last year? I had a number of excellent threads bookmarked on this subject. Wish I still had those bookmarks. Wayne..you are correct. The earliest '12s had the number on the boss behind the cam gear. Mine is there, it's 90xxx. Thanks Tim W! I may have lost my bookmarks? But maybe I haven't yet lost my mind? Is that '12 shaping up okay yet? 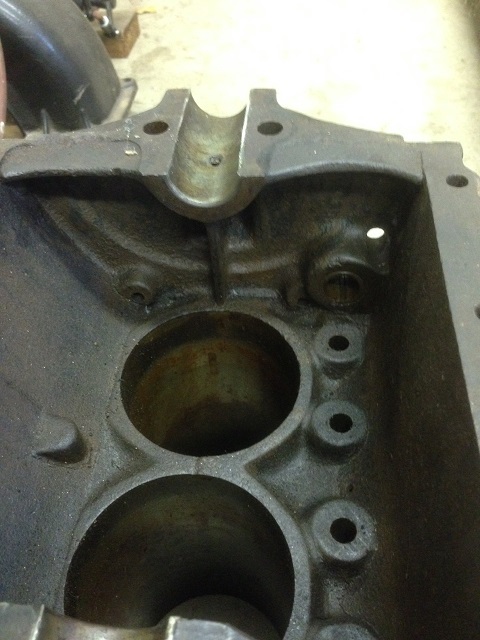 I have an April '13 block, with the casting data over the inlet as pictured above. It isn't legible however, but clearly has an unmodified '13 engine number below it. My theory is this block was at the bottom of the pile outside when the blocks were curing, and it took them awhile to get to the bottom. Rich, Thanks for posting the picture of your '13 block. Larry, can you check your block for a single gusset? The raised area with the stamped numbers looks discolored to the rest of the block composite material.. & the fact the stamping of numbers is quite deep has me personally to believe that it was added by someone other than the factory at later date.. its too prominent .all it takes is for somebody to weld on material grind it back..then heat the area till its red hot then stamp the numbers in..hence the depth and discolored area..
? The only thing I see is it was wire wheeled to clean off the rust and such. The stamped area was cleaned off to identify the numbers clearly. Thanks for the input. Besides, if you read the comments posted above this would have been one of the configurations the number stamp area could have come in.